Enjoying life one day at a time as a wife, working mother, daughter, sister,friend and lover of all things Disney. Today Lauren was with a friend all day so Tim and I went to Luke's soccer game and then I promised Luke we would do something fun together. We had some gift certificates to a local lazer tag place and Luke has been dying to go. When I mentioned to him the two of us could go he instantly became so excited. He started telling me all the techniques to being a good lazer tag player and how much fun it will be being on a team together. As we drove over to the establishment I listened as he went on and on about lazer tag techniques and took in the joy in his eyes and had to fight back a tear as I realized how excited he was to be spending an afternoon with his mom. I cherish these moments and how he still loves to hang out with me. As I dawned my laser tag gear he talked me through the entire battle and we both did pretty well (as the teenage group of boys we were against ganged up on us). As you can tell, he had his game face on : ) Well out of 4 rounds Luke would tell you HE beat ME 2 out of the 4 rounds, but I'm here to tell you that I beat HIM 2 out of the 4 rounds : ) Then we headed over to the basketball hop a shot game and went head to head and he did beat me there by 2 points. As we walked to the car and he reached for my hand and thanked me for a great afternoon my heart skipped a beat. I am so blessed to have a son like Luke and I cherish every single moment with him - wish I could freeze time, o.k, now I'm starting to cry so I'll sign off.................LOVE YOU LUKE!! Our amazing summer is coming to a close. We enjoyed a trip of a lifetime to Disney beginning at the Boardwalk resort, spending 5 glorious nights on the Disney Dream and then ended with concierge level at Animal Kingdom Lodge. We came home and it seemed like in a matter of days we were packed up and back in the car headed to Grand Haven where we stayed a fun filled week enjoying quality family time together. The day after we returned from Grand Haven some friends from New Jersey stayed with us a week- it was nice showing them around the Cincinnati area and taking in a REDS game as a tourist. Tragedy struck right by us last week with a local teenager being shot and killed by her ex boyfriend. This occurred two streets over from us where we take our dog Mickey to doggy day care. The ex boyfriend ended up going home and commiting suicide as the police surrounded his home. This is such a tragedy and our hearts go out to both famlies during this difficult time. The poor girl was gunned down on her 17th birthday. Another tragedy occured that same day, a 3rd year old girl from my school died from cancer - so the reality that life is fragile was quite apparant to us. They enjoyed eating snacks and watching a movie in there before falling asleep. I even crawled in there with them to read them a bedtime story together. We had a thunder storm on night #3 and Luke came upstairs a little scared and said he wanted to sleep in his own bed upstairs by us. I said "o.k., but I worry about Lauren down there by herself, she might wake up a little scared wondering where you went". He said "I know, me too." Then he retreated to his bedroom and I rolled back over and continued my slumber. I awoke around 8:30 a.m. and went to Luke's room and saw he was no longer in there. I went downstairs and he was back inside the tent with Lauren, he said he woke up early and snuck back inside of the tent to make sure she wouldn't be frightened in the morning. Awwwwwwwwwwwwwww. The tent brought my kids together and showed me once again that deep inside they care for one another and enjoy spending time together. This is the first school year that the kids will be in different schools. Luke is headed to the Intermediate School for 5th grade and Lauren will be a 2nd grader, the time keeps slipping away. I know it's the beginning of the end and Luke will start being too cool for me soon enough, but for now, I will cherish these times and lock them away in my mind because they mean the world to me! Yesterday we FINALLY had sunshine here in our part of Ohio and we put on a Yard Sale to raise some money for our upcoming Disney getaway. The kids had been BEGGING to have a lemonade stand forever so we figured since we'd be having traffic anyway it would be the perfect day to do it. They had fun decorating the sign together and it was such fun to watch the joy on their faces as each customer would approach. Lauren was halarious at first, determining how much change she would give back based upon how nice the people were- giving a few customers free lemonade (until Luke found out about it and insisted on their need to turn a profit : ). They earned $10.00 to split for the trip which they were thrilled about. 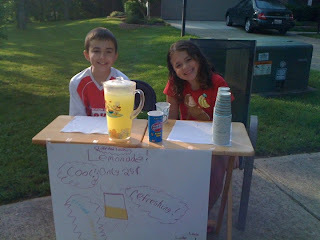 Thanks to all who came out to buy a "refreshing glass of lemonade for only .25 cents! I hope you enjoyed some sunshine this weekend too! We had our Spring Break a few weeks ago and we headed to Kiawah Island South Carolina for a week on the beach. In years past we always had wonderful weather full of sunshine, bike rides around the island and tons of beach time- this year it didn't go quite as planned. There was rain in the forecast every single day, one day they broke a record low temperature of 40 degrees and on the sunny day we had at the end of our vacation there were 40 mile per hour wind gusts on the beach. We had fun exploring Charleston's bakeries on the rain and found some incredible cupcakes and keylime pie to keep us happy despite the 40 degree temperatures and pouring down rain that day. We had an amazing lunch at Poogan's porch in Charleston, which if you are ever there I HIGHLY recommend, YUM! We got to spend a lot of family time together in our beach house, and it was nice time that I know I will always cherish. Was it the most ideal situation? No! Was the vacation all we had invisioned, NO! but did we have great family memories together despite what mother nature handed us, ABSOLUTELY! My favorite memories of the trip were the Amazing Race Scavenger hunts we created as a family. We would set out on bikes on the cloudy drizzly mornings in teams of 2 (my mom and my kids were always on one team, sometimes my dad joined them) and then Tim and I were on the other team with Dave, Barbie and Ben. We would take turns being the clue leaver and the clue finder and the team who was searching had to text pictures of the clues found in order to get the next clue. The hunts took us all over the island and we all had fun doing it- I especially loved the thrill it gave Luke and Lauren. So it's been about a month now since aligned with Pixie Vacations and became an independent travel agent. www.destinationmagic.com (my own personal travel agent website) is going strong. I am LOVING planning Magical vacations for people. I've only been with the company a month and I have already booked several vacations for people to Disneyworld and even my first Disney Cruise Line booking. Tim has been such a help and support helping me get the website up and running, I think it just looks great and am so thankful to have such a supportive husband by my side. He was so encouraging during this entire process and was like my own personal cheerleader! I just love working with my clients to do their personalized itineraries, dining reservations, entertainment reservations, etc. I had a lot of questions when promoting my business these past few weeks - no one seems to believe that I do all of this for free at no cost to them- but I do. It has been such a fun outlet for me. The other exciting thing is that my new column at DisneyDispatch.com has been doing well. It runs every Friday and I now have 3 columns under my belt. Here is a direct link to my column home page: http://www.disneydispatch.com/content/columns/happiest-tips-on-earth/ I've had a lot of people approach me at work encouraging me saying how great it is that I stepped out of the box and finally acted on my dream- I must say I am thrilled this time has come too- it is a very rewarding feeling. As a family we are anxiously awaiting our first sailing on the DisneyDream in June and our first stay at Animal Kingdom Lodge concierge- can't wait to experience new Disney things ourselves, especially after planning so many fun trips for others these past few weeks. Thank you to all of my friends and family who have helped me promote destinationmagic and my services these past few weeks and who have read my column and posted replies- thank you your support means SO very much to me! So....... a few weeks ago at church there was a sermon on following your passions in life and instead of sitting by to actually come up with a plan and act on them.........I was INSTANTLY inspired. As those of you who know me are fully aware, Disney is a huge passion of mine. I enjoy our Disney trips, planning others trips and writing trip reports more than words could express. I have been planning so many trips for people lately and always ask myself (and Tim), why don't I do this for a living!?! Now, I am fully aware that my true gift is education and teaching my students on a daily basis and I have NO intention of quitting my day job but I wanted to pursue something on the Disney front. I am SO happy to report that not only have I followed my Disney planning dreams but I have taken it a step further. I have aligned with a travel agency and have taken online courses and Tim helped me design my new website: http://www.destinationmagic.com/ The site has only been up one week and I've already booked my first vacation and it's just gotten more exciting from there. Starting on Friday I will have my OWN COLUMN on http://www.disneydispatch.com/ entitled "The Greatest Tips On Earth". This will be a weekly column and the owner of the site will also reference my personal travel website within it. I can't tell you how exciting this is for me. I am so excited that instead of standing by and hoping for things I have actually started taking action to watch my dreams come true. I hope you will tell others about http://www.destinationmagic.com if you have friends/family who are planning Disney travel (or ANY travel) and that you will also check out my column this Friday on http://www.disneydispatch.com/ . Happy to be married to my best friend and we have two children who light up our lives. I am a full time special education teacher during the day and teach education courses online through University of Phoenix at night and mentor incoming faculty. 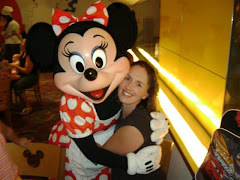 I recently partnered with Pixie Vacations and am a travel agent specializing in Disney travel. My email for travel info is lesley@pixievacations.com My interests are Disney, traveling, Christianity, local theatre, wine, movies, building family memories, etc.